Will America Survive Global Changes? Being on vacation is a wonderful invention for humanity. Over the break from the daily grind, I went with my family to Navarre, Florida. It was quiet and surreal. I enjoyed walking the white sands in tranquility. Yet, the Gulf environment also provided contradictory outlooks. Once the water was clear as a mirror, now it was clouded by dead seaweed on shore. One boy celebrated finding a dead fish washed to shore. I wondered what impact the oil spill had on the pristine environment. The beaches showed evidence of commercialization as I saw trash (i.e. beer bottles, wrappers, etc.) abandoned on the beaches. It made me wonder if the ocean was dead. Can anything be sustained over time? Leaders falter across the globe, from the biggest to the smallest countries. This month, world policy makers were unable to agree on fixes for their economy which sent investors on a wild ride for several weeks. Debts in Europe and the U.S. raise the question about the ability of political leaders to control ‘the trans-Atlanta panic.’ America’s on the blink? 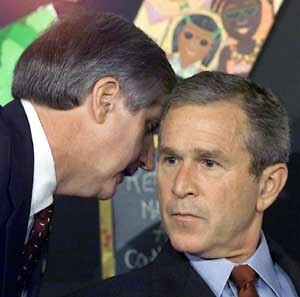 President Bush is notified of the September 11th Attacks. terms of recent performance, but outrank their peers based on fundamental and other qualitative criteria. Yet, American businesses outsource abroad in order to impress investors and shareholders. Corporate executives silently mock politicians, who desire them to pursue a business strategy of ‘creating jobs’ rather than an innate strategy of profitability. U.S. political leaders, unable to break the ideology divide, lead financial investors on a wild goose chase with their indecision and create anxious and cynical citizens worried if they will be able to survive in the future. Given these patterns of disruptive change, today’s institutions need strategic leaders with a clear view of sustaining success. Over the next several months, I will focus on strategic leadership and sustainability concepts in order to assist the next generation of leaders obtain the necessary attributes to overcome unknown circumstances. economy/employment, equity/equality, and education. He notes, “Success requires an understanding of the complex forces at work, a vision of the future and a strategy for making the vision a reality. How are the concepts of traditional leadership at odds with the concept of sustainability as it relates ecology/environment, economy/employment, equity/equality, and education? I don’t see anything being sustained over a long period. Take resources for example, no matter how many new resources we’ll find as a substitute for another, we will eventually exhaust them as well. When we look at the eventual change over of leadership in the government, we can even see how leadership can’t be sustained. This will be problem because the government has done little to prepare for the change over of leadership in the country. (Green, Roberts., 2011, p. 4). Interesting? So…do you feel the terminology of sustainability is a miscue then? Can you teach leaders to be unselfish? The term we use in leadership circles is servant leadership. Is it possible to do these days? Can you teach a leader to be unselfish? I think the answer to this question is – perhaps – nothing is impossible. It will depend on the leader’s personality. A point of interest for this comment, I recently discovered the concept of the Level 5 leader. This is a leader who puts his/her team’s well being and accolades above his/her own needs for accolades and attention. This in essence is a leader who is unselfish – but this is a personality type not entirely something learned. Im not sure if you can teach leaders to be unselfish; however, i do believe it is still possible for leaders to possess the servant characteristic that you mentioned above. In my experiences, servant leadership occurs in situations in which the leader has a true passion and a great amount of care for the organization or the cause they are working for. Leaders can be taught to be unselfish if they are mentored by unselfish leaders. Setting the example and beating out the path for the next generation of leaders is crucial in ensuring sustainable leadership not only for corporations but for our country as well. Unfortunately, for us, Washington has not done a very good job at that. In the business world, servant leadership defines a leader who, when good things happen, gives his/her team all the credit, as Mr. Berger mentioned. Servant leadership also entails the leader taking full responsibility when things are not going good. Mr. Mundy mentioned the word passion; I would like to add the word investment-a truly selfless leader makes a personal investment in his / her people as a function of helping them be successful. You have some very good points. I do believe our nation has failed to emulate the actions and morals of our past leaders. I argue that it is not that America’s leaders are oblivious to what it takes to lead, rather the leaders have simply chose to ignore the necessities of true leadership only to be poisoned by the glitz, glamour, fame, and power that comes with the responsibility. As Dr. Darryl D. Green and Gary Roberts (2011) point out, “Many individuals want the limelight of leadership; however, they do not want to make the sacrifices to be a very effective leader” (p. 5). Hopefully, this horrible trend will not continue. Good leaders are here in our country. However, it is our duty as the followers to put the true leaders into a position where all may succeed. Green, D. D., & Roberts, G. (2011). Impending danger: The federal handbook for rethinking leadership in the 21st century. Deer Park, NY: Linus Publications, Inc. Yet, is this leadership void only in America? You have addressed a problem in leadership morality but how do you relate this to sustainability? What concrete suggestions or implications are you making in terms of bettering corporate or political leadership to change the status quo? A better strategy is not to focus so much on the present and be more forward thinking. Envisioning the change that you want in the future allows you to make the necessary changes and establish milestones to accomplish your goal. If America has become self serving, what forces are driving this behavior? Do you think it is solely corporate greed? Great questions! You have the heart of a professor! I agree with you. We really need to work on making stronger leaders, especially with everything that is happening in today’s world. Leaders today need to look at the company as a whole. They needto be concerned with more than just making a profit. Gamble and Johnson, Jr. (2011) state that such leaders are committed to a higher standard of performance that includes social and environmental metrics as well as financial and strategic metrics. Leaders need to understand that there is much more to being a leader than just bringing in a profit. Gamble, J., & Thompson, A. (2011). Essentials of Strategic Management. The Quest for Competitive Advantage. New York, NY: McGraw-Hill Irwin. Excellent! We need leaders who are holistic in their approaches! I definitely think that we are in peril times as a country and economy right now. Our country has been prosperous for so long, and I truly feel that in order to continue this prosperity we are going to have to amend the ways of our ‘traditional leadership’. It is obvious that something isn’t working, and the economy and business world is shifting right out from under the United States. Andres Edwards states, “The concern for our longevity represents a maturing of our kind…into it’s fullest stature – one worthy of being sustained.” (Edwards, 14). As a country (and businessmen/women of this country), we must step up to the plate – to our fullest potential – and do our best to help our country with the changing economy, jobs, and leadership. You bring up some very important points. The prosperity that our country has enjoyed for quite some time is currently being threatened by our complacency. The majority of problems that as a nation we are now experiencing were at some point in the past minimal. But, those things that we are not willing to face in due time will most certainly only become over-sized. It is now time to take responsibility for our actions and to amend our past mistakes. This concept of sustainability offers an attractive profile to tackle some of our encroaching challenges in an innovative and proactive way. America was built on an idealistic mantra that rewards hard work and decency. Let’s not forget of what made us great. There is a shift in the workplace atmosphere. Instead of leaders focusing on the team as a whole, they are focused on themselves. Instead of trying to advance the company, the new generation of leaders tends to focus more on advancing their career. This is different from the generation prior, where the leaders were focused on being leaders to their team. The new generation poses a threat to the sustainability of the economy. The government has spent little time in the development of future leadership. (Green, Roberts, 2011, p. 6) If the new generation leaders aren’t trained properly, how will they know how to effectively run a business? If they are only focused on their career, how will the economy survive? I agree with your post that there is a shift in the leadership of organizations today from a team captain to the “I” generation of leaders. I feel that it is a leader’s responsibility to lead the organization with the future in mind, not to be blinded by their personal bias. The future of our nation as well as corporate America relies on leaders who are willing to be mentors and that have the courage to empower individuals to be their successors. The leaders of today’s organizations must be accepting of and willing to produces a leadership legacy. This is the only way to insure the future of the organization long after the current leadership has relinquished control. The standard of an effective leader is to provide purpose, direction, and motivation to accomplish a unified corporate goal. In most companies this goal is profit maximization. The status quo of classical sustainability is that it requires more financial costs to operate “green” and lowers market competitiveness. The divergence from this thought is that sustainability = innovation in terms of reusable byproducts of manufacture leading to increasing profitability or maximizing efficiency actually reduces operating costs. An example from Nidmolu is FedEx, which deploys a fleet of 700 aircraft and 44,000 motorized vehicles that consume 4 million gallons of fuel a day. Despite the global slowdown, the company is replacing old aircraft with Boeing 757s as part of its Fuel Sense program, although it will postpone ordering new ones until 2010. This will reduce the company’s fuel consumption by 36% while increasing capacity by 20%. Following some other pioneers, FedEx recently turned its energy-saving expertise into a stand-alone consulting business that, it hopes, will become a profit center. Nidumolu, R., Prahalad, C. K., & Rangaswami, M. R. (2009). WHY SUSTAINABILITY IS NOW THE KEY DRIVER OF INNOVATION. (cover story). Harvard Business Review, 87(9), 56-64. Retrieved from EBSCOhost. Traditional leadership is rightfully vigilant to squandering profits, and wary of redirecting a company’s sector to an environmental focus. Many leaders see the potential in sustainability, but have no prospective ideas. Lubin and Esty see the road map as “already drawn out.” They classify the movement towards sustainability as a “mega-trend” that typically grows out of financial crisis or threat of conflict over resources. An example would be the cold war, with similar geopolitical turmoil and uncertainty, which launched the space race and provided rapid developments in microelectronics. An example of a winner in sustainability is GE’s ecoimagination product line, which has generated tens of billions of dollars in revenue and positioned the company as a leader in rapidly growing market segments such as high efficiency appliances, energy infrastructure, and jet engines. Clorox’s Greenworks line of eco-friendly cleaning products has also been successful by reframing the public’s perception of the company, while also generating billions of dollars in sales. By managing this new “mega-trend” correctly, as successful companies have managed past equivalents, seemingly insurmountable uncertainty is strong ground for profitability. Lubin, D., & Esty, D. (2010). The Sustainability Imperative. Harvard Business Review, (May 2010), 1-9. We seem to be sharing the same brain today. The world is been changing very fast. Every minute something is found or developed and we need to keep improving ourselves. Nowadays, to be a good leader it is crucial to be willing to learn and change. Many problems that we had in the past do not exist anymore or we know how to handle it. I believe many problems that do not exist will still come and the new leaders need to be aware of the actual problem and common good in order to be able to resolve them. Bad leaderships defined as being unwilling or unable to control personal desires such as seeking for power stead of common good. (Green, Roberts, 2011, p. 5). The federal government has spent little time or resources in the development of future leadership (Green, Roberts, 2011, p. 6). The issue of sustaining leadership is a major problem in many of today’s organizations not just the federal government. The problem is that many leaders today lack the insight to leave a legacy of succession for the future of the company. However, this should not be the case. Instead, it is a leader’s responsibility to lead the organization with the future in mind not just the current situation. The lack of sustainability should be major factor that today’s leaders should have learned from recent economic crisis. If not we will continued to see major corporations crumble without leaders who are commitment to the future growth and success of the organizations in which they lead. Maxwell, J. C. (1998). The 21 irrefutable laws of leadership. Nashville,TN: Thomas Nelson Inc. Traditional leadership styles are becoming a thing of the past. In order for companies to maintain market growth company executives must implore new methods of not only business but leadership styles in order to maximum share holder’s investments. With the current market situation companies cannot continue to allow past principles / ideas to dictate the course of business. Organizations that are able to break from traditional roles will be better positioned to sustain market success. Over the past decade companies have tried time and time to grow / sustain market share through company mergers, acquisitions and other approaches. As noted in the Harvard Business review companies who implore these techniques often find themselves destroying more value than creating. So how do companies succeed in this 21st century? The answer is in those companies that continue to generate growth through new ideas. Organizations who are able to shape the market through new business ideas, technologies will be better equipped to sustain and stimulate growth for decades to come. Sustainability is the capacity to endure. This can be seen in many systems. You mention the Gulf coast and the BP oil spil. Undoubtedly this has had an affect on that area’s ecology. However, one only needs to look at the area of Prince William Sound Alaska where the Exxon Valdese ran aground – the largest oil spill in US waters to see the sustainability of the ecology/environment in that area is resilient. I have to think that other areas mentioned above, with regard sustainability, have to be that resilient as well – at least I hope they are. Today, leaders must take into account the social and ecological ramifications of their decisions, not just their economic bottom line. Well, really there is no such thing as traditional leadership; it is always evolving to match the next disruptive change. Leadership styles and management thought has changed dramatically throughout the years adopting practices that more appropriately meet the needs of businesses as business evolves. Currently, however, instead of a disruptive change that has hit the market, it seems that a series of disruptive changes have occurred leaving the business world spinning. In order to grow and adapt to these changes we will create new business models and leaders with styles we never thought about will emerge. It must happen and will happen in business and education as well. The saying that necessity is the mother of invention is so true. ” Life has a unique way of revealing to us areas that we could use some work and that is a good and healthy thing. The trick is to recognize those things when they occur.” (Boudreau, 2011) Creativity and adaptability are the keys. Stakeholders matter, not just the shareholders interests in an organization. The United States is lagging behind in this perspective and it is hurting us because job creation and sustainability should be just as important to a company as creating wealth for its shareholders. The world has known that we should be more energy efficient and create better products but would not until they were forced to do it by the consumers. That is so right, there should be a hypersensitivity with management developing future managers. They should be spending a greater portion of their budgets on training and R & D. As Dr. Green states in his book, Impending Danger, “The government has spent little time in the development of future leadership.” This traditional leadership mold should have been broken many years ago. As usual we are not about to change unless we are forced to, because change costs money. It is already evident that this resistance to change is already leading to disruption in this country which equals loss of competitive advantage, job loss, decreased confidence from investors and the American people. Business is always evolving to match the next disruptive change. Leadership styles and management thought has changed, adopting practices that more appropriately meet the needs of businesses as business evolves. Instead of a disruptive change that has hit the market, it seems that a series of disruptive changes have occurred leaving the business world spinning. We will grow, adapt, and create new business models and leaders and styles we never thought about will emerge. It must happen and will happen in business and education as well. “Life has a unique way of revealing to us areas that we could use some work and that is a good and healthy thing. The trick is to recognize those things when they occur.” (Boudreau, 2011) Creativity and adaptability are the keys. Stakeholders matter, not just the shareholders interests in an organization. We are lagging behind in this perspective and it is hurting us because job creation and sustainability should be just as important to a company as creating wealth for its shareholders. We know that we should be more energy efficient and create better products but would not until they were forced to do it by the consumers. That is so right, there should be a hypersensitivity with management developing future managers. They should be spending a greater portion of their budgets on training and R & D. As Dr. Green states in his book, Impending Danger, “The government has spent little time in the development of future leadership.”(Green & Roberts, 2011) This traditional leadership mold should have been broken many years ago. As usual we are not about to change unless we are forced to, because change costs money. It is already evident that this resistance to change is already leading to disruption in this country which equals loss of competitive advantage, job loss, decreased confidence from investors and the American people. In today’s volatile business environment, executive level management must look into every fold of the organization to find viable candidates to take their business into the future. Leadership development will no longer follow the “traditional” path of employees working in an organization for years and years and inheriting leadership roles every so often until they are at the top. To ensure sustainable leadership, companies must recognize that the ones who want to be the next generation of leaders do not always stand out among the crowd. They quietly let their performance do their campaigning for them and look for ways to advance such as furthering their education or learning as much as they can about everything they can in the organization. Leaders must be aware of the value of the organization’s human capital and be willing to empower those that want to lead into the future. Traditional leadership is often thought of as the ability to move masses or to get things rightly done. However, the concept of sustainability includes these characteristics while at the same time demands consciousness of the long lasting impact that these actions have on the environment and societies. As Andres R. Edwards(2005) points out, “The Sustainability Revolution presents an alternative that supports economic viability and healthy ecosystems by modifying consumption patterns and implementing a more equitable social framework” (p. 3). These practices are not only eco-friendly, the also affect the bottom line in a positive way. By applying these fundamentals of sustainability, corporations can enjoy federal incentives such as “the federal Energy Efficient Builder Tax Credit available to offset some of the cost of some green building upgrades” (NAA, 2011). The hope now is that these corporate initiatives become more widespread in the near future. National Apartment Association(NAA). (2011). Advantages of Going Green. 1. KEEP 200 WORDS INITIALBusiness is always evolving to match the next disruptive change. Leadership styles and management thought has changed, adopting practices that more appropriately meet the needs of businesses as business evolves. Instead of a disruptive change that has hit the market, it seems that a series of disruptive changes have occurred leaving the business world spinning. We will grow, adapt, and create new business models and leaders and styles we never thought about will emerge. It must happen and will happen in business and education as well. “Life has a unique way of revealing to us areas that we could use some work and that is a good and healthy thing. The trick is to recognize those things when they occur.” (Boudreau, 2011) Creativity and adaptability are the keys. Stakeholders matter, not just the shareholders interests in an organization. We are lagging behind in this perspective and it is hurting us because job creation and sustainability should be just as important to a company as creating wealth for its shareholders. We know that we should be more energy efficient and create better products but would not until they were forced to do it by the consumers.